Custom Cabinets can Make or Break your Kitchen Remodel! 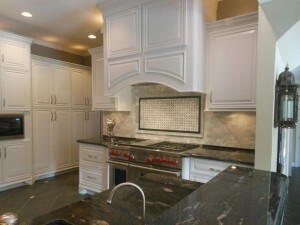 Home / Custom Cabinets can Make or Break your Kitchen Remodel! / Home Remodeling / Custom Cabinets can Make or Break your Kitchen Remodel! When homeowners remodel their kitchen, there are a number of things that are always high on the “must have” list: marble or granite countertops, new appliances, updated flooring. But quite often, giving your cabinetry an overhaul follows behind those other requests. But there is no better time to re-think your existing storage in the kitchen than when planning a remodel! If you’re upgrading your countertops, your existing cabinetry is already prime for removal. And new appliances will often be slightly different in size than your original models. And new counter tops often mean a new backsplash to tie things together. It’s the best time to consider how your storage is — or isn’t — working for you. * Are the things you need most easily accessible? * Are your cabinets over-crowded? * Do you find yourself wishing for more drawers than doors, or vice versa? * How do they look? Will they fit in with the rest of your remodel? Remember, custom cabinets these days aren’t just about doors and drawers. There are open slots for storing larger items, like roasting pans and cookie sheets, bookshelves, and more. Talk to the experts at Wood Haven Construction for a complete list of options. We guarantee you’ll be happier with your new cabinets than you ever thought possible! Wood Haven Construction - The Home Remodeling Experts in Houston, TX. With over 25 years of experience, you can count on Wood Haven Construction for all your remodeling needs. We are proud to be a Preferred Contractor in James Hardie’s National Replacement Contractor Program. DON’T BE INTIMIDATED BY INTERIOR PAINTING: A LITTLE TIME AND TINT GO A LONG WAY FOR IMPROVING ROOMS! CREATING A CEMENT PRECAST MOLD WALKWAY: A PERFECT POLISHED PROFESSIONAL FINISH FOR YOUR HOME GARDEN. CONVERT YOUR GARAGE INTO A PERFECT HOME GAME ROOM FOR YEARS OF FUTURE FAMILY FUN! HOW TO START A FIRE: SUCCESSFULLY BUILD AND MAINTAIN A FIRE IN YOUR BACKYARD OR CAMPGROUND FIRE PIT! JUST HOW MUCH DOES A LEAK COST? COUNTING THE COST OF A DRIPPING FAUCET ON YOUR HOUSE AND YOUR WALLET. HOW TO CHOOSE, REMOVE, AND INSTALL A WATER HEATER: REPLACE YOURS NOW FOR HOT BATHS AND SHOWERS LATER. CHOOSING KITCHEN CABINETS FOR YOUR REMODEL: AN IMPORTANT CHOICE FOR FUNCTIONALITY, DESIGN, AND STYLE. PAINTING YOUR HOME’S EXTERIOR: AN EASY DO-IT-YOURSELF HOME IMPROVEMENT PROJECT FOR THE NEW HOMEOWNER. CHOOSE FIBER CEMENT BOARDS FOR A LONG LASTING, STYLISH SIDING FOR YOUR HOME, FOR MANY YEARS TO COME! CLEAR VIEWS AHEAD: INSTALLING ENERGY-SAVINGS WINDOWS IN YOUR HOME TO ENSURE A WARM WINTER WITHOUT WASTE!